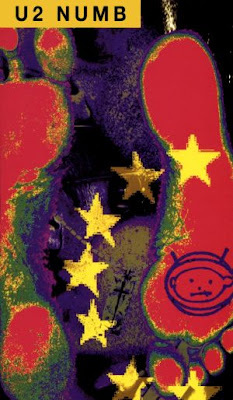 "Numb" was released as the Zooropa's first single in July 1993. Numb is a repeating, monotonous mantra spoken by The Edge with a drumbeat sampled from the Leni Riefenstahl film Olympia. "Numb" also features backing vocals by Bono and Larry Mullen. While the The Edge sings the main lyric in a slow monotone that David Duchovny would be proud of, while Bono sings around it in his 'opera' voice. Check out the lyrics to "Some Days Are Better Than Others" and "The First Time" both being from U2's eight album.